UPDATED: Wed., Aug. 15, 2018, 8:26 p.m.
Robin Haase, Netherlands, def. Alexander Zverev (3), Germany, 5-7, 6-4, 7-5. Marin Cilic (7), Croatia, def. Marius Copil, Romania, 6-7 (4), 6-4, 6-4. Novak Djokovic (10), Serbia, def. Adrian Mannarino, France, 4-6, 6-2, 6-1. Kevin Anderson (6), South Africa, def. Jeremy Chardy, France, 7-6 (6), 6-2. David Goffin (11), Belgium, def. Benoit Paire, France, 5-7, 6-4, 6-2. Milos Raonic, Canada, def. Malek Jaziri, Tunisia, 6-3, 7-5. Pablo Carreno Busta (13), Spain, def. Bradley Klahn, United States, 6-4, 6-4. Grigor Dimitrov (5), Bulgaria, def. Mischa Zverev, Germany, 7-6 (5), 7-5. Karen Khachanov, Russia, def. Sam Querrey, United States, 7-5, 6-4. Marton Fucsovics, Hungary, def. Guillermo Garcia-Lopez, Spain, 6-7 (5), 6-4, 7-5. Nick Kyrgios (15), Australia, def. Borna Coric, Croatia, 7-6 (1), 0-6, 6-3. Stan Wawrinka, Switzerland, def. Kei Nishikori, Japan, 6-4, 6-4. Sloane Stephens (3), United States, def. Tatjana Maria, Germany, 6-3, 6-2. Aryna Sabalenka, Belarus, def. Karolina Pliskova (9), Czech Republic, 2-6, 6-3, 7-5. Elise Mertens (15), Belgium, def. Rebecca Peterson, Sweden, 3-6, 6-2, 7-6 (1). Lesia Tsurenko, Ukraine, def. Garbine Muguruza (7), Spain, 2-6, 6-4, 6-4. Ekaterina Makarova, Russia, def. Alize Cornet, France, 6-2, 6-0. Ashleigh Barty (16), Australia, def. Kaia Kanepi, Estonia, 7-5, 6-3. Angelique Kerber (4), Germany, def. Anastasia Pavlyuchenkova, Russia, 4-6, 7-5, 6-4. Madison Keys (13), United States, def. Camila Giorgi, Italy, 6-2, 6-2. Anett Kontaveit, Estonia, def. Maria Sakkari, Greece, 6-1, 6-3. Kiki Bertens, Netherlands, def. Caroline Wozniacki (2), Denmark, 6-4, retired. Ivan Dodig, Croatia, and Robin Haase, Netherlands, def. Artem Sitak, New Zealand, and Stefanos Tsitsipas, Greece, 6-4, 6-7 (5), 10-6. Juan Sebastian Cabal and Robert Farah (7), Colombia, def. Ben McLachlan, Japan, and Matwe Middelkoop, Netherlands, 7-5, 6-3. Jamie Murray, Britain, and Bruno Soares (4), Brazil, def. Ryan Harrison and Nicholas Monroe, United States, 6-4, 7-6 (9). Feliciano and Marc Lopez, Spain, def. Mike Bryan and Jack Sock (2), United States, 6-3, 6-0. Andrea Sestini Hlavackova and Barbora Strycova (3), Czech Republic, def. Nadiia Kichenok, Ukraine, and Anastasia Rodionova, Australia, 6-2, retired. Elise Mertens, Belgium, and Demi Schuurs (6), Netherlands, def. Jennifer Brady and Caroline Dolehide, United States, 7-6 (5), 5-7, 10-7. Andreja Klepac, Slovenia, and Maria Jose Martinez Sanchez (4), Spain, def. Alize Cornet, France, and Aleksandra Krunic, Serbia, 5-7, 6-4, 10-2. MASON, Ohio – Novak Djokovic completed his comeback from elbow surgery by winning Wimbledon for the fourth time. He’s inching closer to one of the few titles to elude him throughout his career. 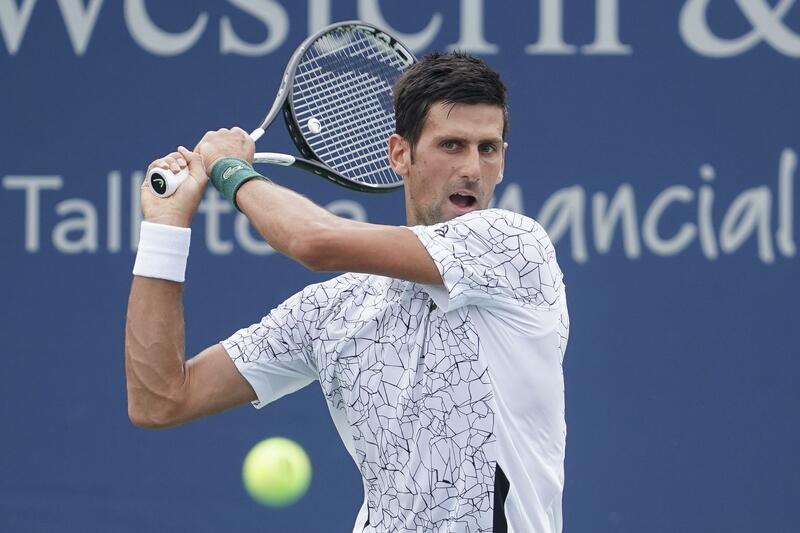 Djokovic has reached the finals at Cincinnati five times and dropped all five matches – three to Roger Federer, two to Andy Murray. Stephens – the defending U.S. Open champion – overcame a thumb injury during a 6-3, 6-2 victory over qualifier Tatjana Maria. Sloane reached the semifinals last season in Cincinnati – her best finish – before heading to the U.S. Open and getting the title. Published: Aug. 15, 2018, 9:35 a.m. Updated: Aug. 15, 2018, 8:26 p.m.